Writing a play is no small feat. Having to write a play in under 24 hours with certain prompts and a cast full of various talents is a challenge in and of itself. 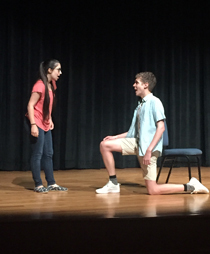 Alpha Psi Omega, William & Mary’s theatre honor fraternity based out of the theatre, speech and dance department, hosted the annual 24 Hour Play Festival this past weekend. Starting at 5 p.m. on Sept. 1, student writers and directors had 24 hours to audition, write, direct, and produce a short play for an audience. 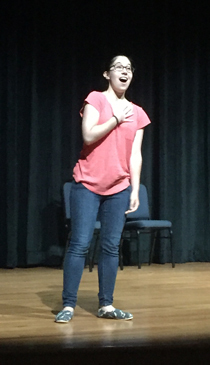 Under the theme of celebrating 100 years of coeducation at the university, six unique plays were performed on the stage of the Commonwealth Auditorium in the Sadler Center on Sept. 2. In addition to the theme, quotes from famous alumnae as well as current President Katherine A. Rowe were utilized in the plays as beginning and ending lines of every piece. An additional prompt was added for the writers during their writing process. With these things in mind, writers set out on Saturday night to create entertaining and cohesive pieces that incorporated all of the factors required, including the given quotes and the Mako Mori Test. Auditions for this year’s festival were quite popular, yielding several talents that were exemplified in the plays, including tap dancing and stage combat. With six casts exemplifying various talents, as well as their acting chops, the 24 Hour Play Festival also included a philanthropic aspect. Proceeds from the festival went to Clowns Without Borders, a Spanish humanitarian group that offers comedy and entertainment to people in areas of crisis or adversity. A suggested donation of $3 was advertised at the door. “I am thrilled to say we raised over $200,” said Marksteiner. To bring fast-paced, comedic theatre to the stage of William & Mary aligns closely with the central mission of Clowns Without Borders. On top of collecting a half dozen original plays, Alpha Psi Omega and those involved also unified themselves under the celebration of 100 years of coeducation on campus, as well as raising money for a cause close to the heart of the theatre department. “Every year of my involvement in the theatre department here I have known it to be home to a powerhouse group of women in leadership roles, which has made our collaboration with 100 Years of Women that much more exciting,” said Marksteiner.